Brightened with lemon zest and peppery ramps, this mushroom and cheese tart makes a great breakfast or lunch with a salad. 1. Heat 3 tbsp. oil in a 12" skillet over medium-high heat. Add mushrooms, shallot, and salt and pepper; stir to coat in oil, and cover skillet. Cook until mushrooms release most of their liquid, about 5 minutes. Uncover and continue cooking, stirring occasionally, until all liquid is evaporated and mushrooms are browned, about 10 minutes more. Transfer to a bowl and set aside to cool. 3. Heat oven to 375°. In a medium bowl, stir together goat cheese, parmesan, cream, 1 tbsp. lemon zest, egg yolk, and salt and pepper until smooth; set aside. Place puff pastry on a floured work surface and roll into a 16"-long rectangle. Transfer dough to a 14" x 4" tart pan and let excess hang over edge. Spread mushrooms over bottom of dough; place dollops of cheese mixture over mushrooms and using your fingers or a spatula, spread cheese as much as possible over mushrooms. 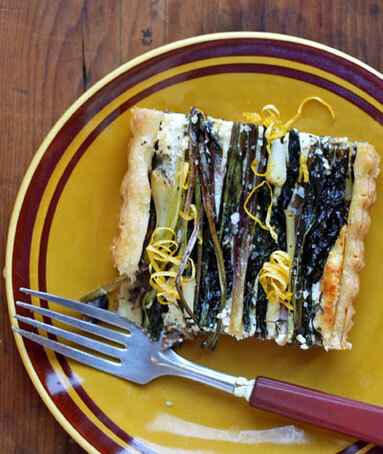 Arrange ramps lengthwise over cheese and mushrooms, and then trim and discard excess pastry from tart pan. Bake tart until crust is golden brown, about 30 minutes. 4. Transfer tart to a wire rack and let cool; unmold tart and transfer to a serving platter. Sprinkle remaining lemon zest over the top of the tart along with thyme leaves and fleur de sel. Serve at room temperature.